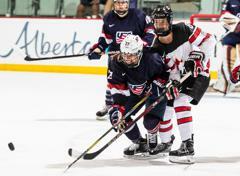 CALGARY, Alberta -- The U.S. Under-22 Women's Select Team overcame a third-period deficit to earn a 3-1 win over Canada in the second game of the 2018 Under-22 Series. 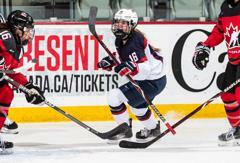 In the night's opening matchup, the U.S. Under-18 Women's Select Team fell to Canada, 4-3. Both series will wrap up on Sunday (Aug. 19). For a recap of each contest, see below. Jincy Dunne (O'Fallon, Mo.) 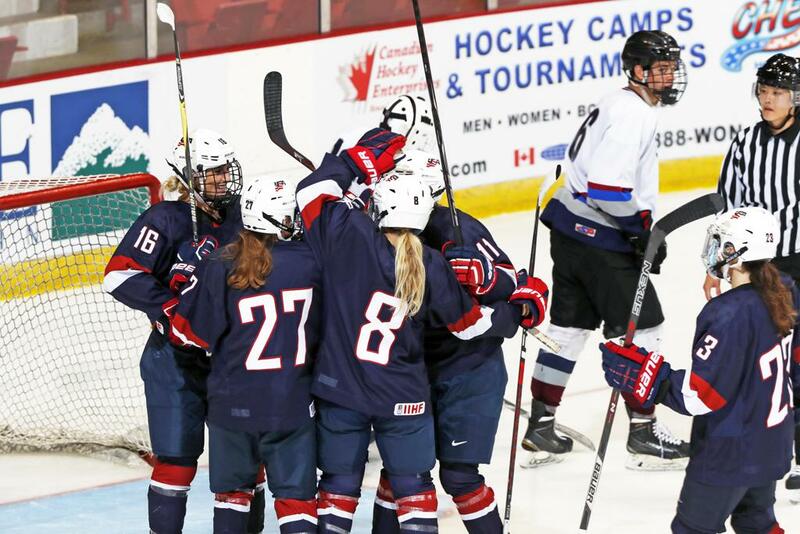 scored the game-winning goal with 7:21 to play as the U.S. Under-22 Women's Select Team overcame a third-period deficit to earn a 3-1 win over Canada here tonight in the second game of the 2018 Under-22 Series. Both teams got off to a strong start in the opening frame, but neither could break through. The U.S.'s best opportunity came with 3:19 remaining in the period as Melissa Samosevich (Sandy Hook, Conn.) picked up the puck in the neutral zone and carried it forward before dropping it off for linemate Rebecca Gilmore (Wayland, Mass.) at the top of the right face-off circle. Gilmore put a shot on goal with Abby Roque (Sault Ste. Marie, Mich.) streaking toward the net for the rebound, but the attempt was staved off by Kristen Campbell. U.S. goaltender Kaitlin Burt (Lynn, Mass.) thwarted back-to-back Canadian attempts 4:33 into the middle frame when Josiane Pozzebon split two defenders for a clear shot on net, then gathered her own rebound for another shot. With 4:29 remaining in the second stanza, Canada struck first. Ryleigh Houston scored from the right face-off circle on an odd-man rush to put the Canadians ahead, 1-0. Maureen Murphy (Buffalo, N.Y.) evened the score for the U.S. 2:52 into the final period when she deflected a shot sent into traffic by Dunne. 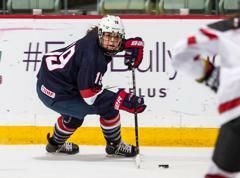 The U.S. took the lead with 7:21 left to play when Dunne banged home a one-timer from the top of the right face-off circle on a feed from Natalie Buchbinder (Fairport, N.Y.). 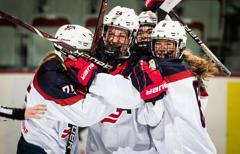 Sydney Brodt (North Oaks, Minn.) scored an empty-net goal with 23 seconds left to secure the victory for Team USA. Burt finished with 25 saves to earn the win for the U.S. 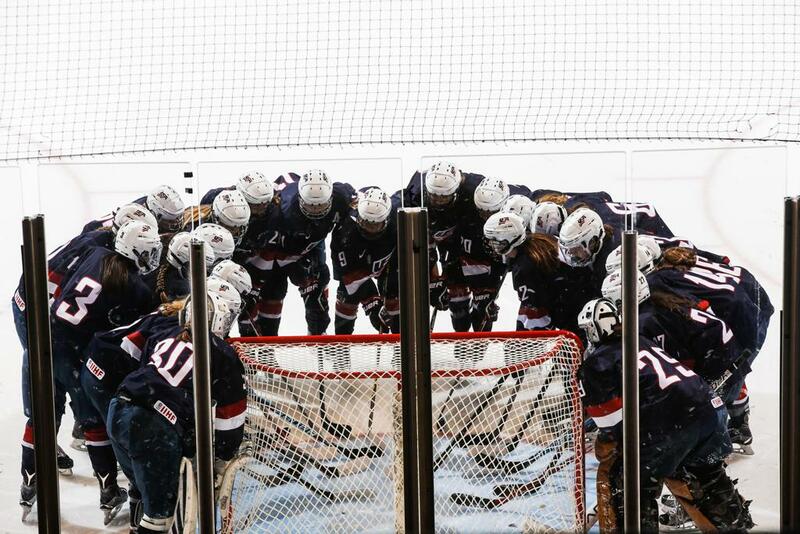 The U.S. Under-22 Women's Select Team closes out its series against Canada on Sunday (Aug. 19) at 10 a.m. local time/12 p.m. ET. The game will be streamed live here. Three different players netted goals, but the U.S. Under-18 Women's Select Team fell to Canada, 4-3, here tonight in game two of the 2018 Under-18 Series. Canada opened the scoring early when Grace Shirley connected with Julia Gosling in front to tally just 15 seconds into the game. USA evened the score at one apiece 1:59 into play when Lacey Eden (Annapolis, Md.) won a puck battle behind the net and tucked it inside the near post. Kiara Zanon (Rochester, N.Y.) and Sydney Bard (New Hartford, N.Y.) picked up assists on the play. Casey O'Brien (Milton, Mass.) 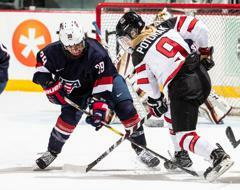 put the U.S. in front when she scored a power-play goal with 7:57 remaining in the opening frame. The play started when Maggie Nicholson (Minnetonka, Minn.) fired a shot from the seam that was redirected off the skate of Abbey Murphy (Evergreen Park, Ill.) and bounced off the post. O'Brien picked up the loose puck in the crease and finished for the go-ahead goal. Canada's Nicole Gosling beat Natalie Ferenc (Orchard Lake, Mich.) through the five-hole 9:52 into the second period to tie the game, 2-2, and then Danielle Serdachny carried the puck in and dropped it back for Anne Cherkowski for the go-ahead score with 2:53 remaining. With just three seconds on the clock in the middle frame, O'Brien won the face-off back for Murphy, who skated in and scored from between the hash, sending the U.S. into the third period tied with Canada, 3-3. Julia Gosling netted a power-play goal for Canada with 6:59 to play that would hold as the game-winner. Ferenc finished with 28 saves in net for Team USA. 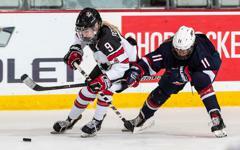 The U.S. Under-18 Women's Select Team closes out the series against Canada on Sunday (Aug. 19) at 1 p.m. local time/3 p.m. ET. The game will be streamed live here.